Technology for Startups: Open Source vs Contemporary? Technology for startups – Open Source vs Contemporary? 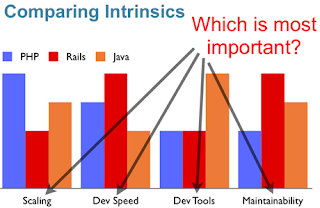 and their comparative value in a post open source Java world. Java is a great programming language and did bring revolution in the object oriented concepts, (esp. when we look back into the time of applets) ; and now with all kind of Flash/AJAX rules and XHTML concepts, its really been diversified and things have changed drastically. With the advent of Open source concepts,the changes taking place on a web programming level is really mesmerizing. It has brought in all set of features and can pamper the User Interface to a new level. Open Source concepts are good to be implemented, but one needs to be overcautious and needs to be a core (read die-hard) programmer who could understand things better. Scalability, Dev Speed, Dev Tools, Maintainability. The fact that open source options are being stacked up against the likes of Java and .NET, and have a similar levels of support is a blessing. Today, with the open-sourcing of Java,we have a new entry onto the field. Rather than exclude one or another, this arrival is going to make the open source web world, warmer, more sophisticated, and for better or worse, a little sunnier. Myself being an avid Java lover and been into EAI application from last 4 years, it took me less time to have a makeover and to adopt to the open source policies and now I worship PHP. Its pretty easy to migrate, spend couple of sleepless night and within fortnight you are up and running with Open Source (also depending on what, where you need to implement). Open source applictaions, at enterprise level, it hasn’t had a firm footprint. On a Enterprise level Open Source can’t replace existing Mainframes, Java applications and Integrtaion solutions, but on a relatively small scale its a clear winner by using good web services we could still match to the existing features, it all depends on new version to be released for PHP and Ruby, PHP does support XML and XSLT, but not to full extent. Community support for open source is BEST, get registered with active groups and you are done, you would get all the support related to it. Future looks bright for Open Source medium, the more migration from the monopoly level, it gives a edge for Open Source movements, In India open source is yet to evolve, we are more into Servicing the existing products and Open source always regards to build new product, so hope it does change the theme in India. e. Learning curve – what extra do i need to learn to use the language? The only investment needed is technical expertise and to have good friends within the community, you need to be a programmer first and could migrate to Open source on the needs.